The reason for the trip was to celebrate with fellow 3beards having just signed the deal to sell our startup job board, Unicorn Hunt. 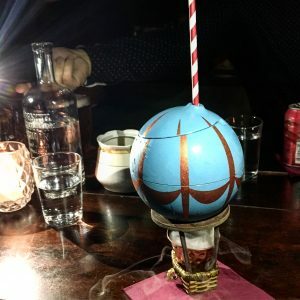 We picked an old favourite, Ozone, to enjoy cocktails and a delicious dinner (yes now they stay open every week night) and topped off the night at another favourite, Worship Street’s Whistling Shop. I love visiting familiar places but what always surprises and excites me about going back to Old Street – even after only a few months away – is that there is always something new opening up, keeping the vibrant area alive and interesting. This visit was no different and so I made it my mission to explore. I was very excited to find that Old Street Records had opened up a brand new café, only a week before my visit. Having arranged to meet an old friend I suggested we check it out, and soon we were settled into the unpretentiously cool environment. 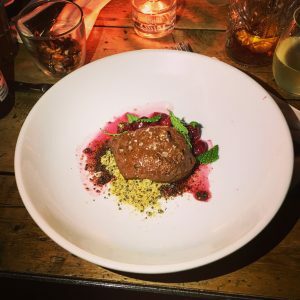 Being an add-on to their live music venue, with exposed brick walls and pink tiled table-tops, you would be right to be wary of such an establishment, especially opening in a strongly hipster area like Shoreditch. However even only one week after the launch, Old Street Records Café has created a really welcoming and relaxed space to meet friends, have meetings and tuck into beautifully presented, delicious coffee. What I noticed really early on was the warm welcome. The staff were chatty and approachable. I accidentally said “grazie” rather than “thanks” to the guy who had just brought me my coffee and next thing I know we’re comparing addresses as he came from a place not far from where I live now. The coffee as I said was really good, and hugely appreciated on a crisp autumn morning, plus the pastries certainly didn’t disappoint. 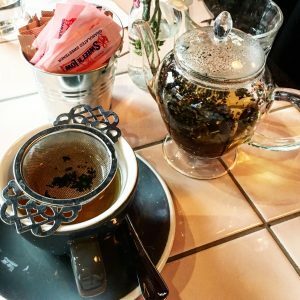 My catch up lasted long enough to further explore the café’s offering and soon I was pouring loose leaf peppermint tea from a stunning glass teapot. Maybe it’s just that peppermint tea is hard to find in Italy but this was pretty special. I asked about the brand they were using and they kindly showed me the Rare Tea Co which not only tastes great but is also beautifully packaged and comes with advice on the temperature of water you should be using. Too many people pour boiling water straight out of the kettle and then complain that the tea is too bitter. Temperature is important people – get geeky! Anyway I’m getting a little side tracked. 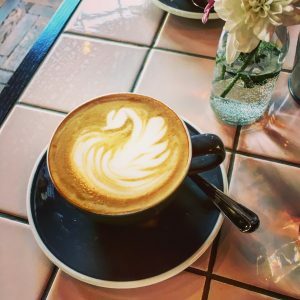 I really enjoyed Old Street Record’s Café and would definitely recommend it to anyone looking for a cosy and convenient place to grab a coffee. I believe there is a lunch menu coming soon too, so if you’re in the area, be sure to check it out. 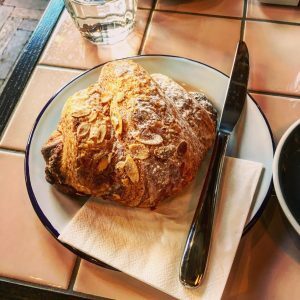 I spotted Sans Pere online (I think it was the LOTI newsletter) and realised that it was the same address as my old regular, Eighty Four. I did a quick tweet and got a prompt response from the manager, Lucy, confirming my suspicions. Of course I had to check it out and so booked in for lunch with my boyfriend. Now, let’s not beat around the bush – there has been some serious money thrown at that place to transform it from laid back, perfect for weekend brunch café, to new wave digital startup, Shoreditch House eat-your-heart-out trendy. It’s not really a café. Nor is it a restaurant. There’s a large table on the left full of Macbooks attached to clearly-not-too-bothered-about-the-bottom-line entrepreneurs. The website boasts “property” alongside “food” and “events” because the founder, Barney Goff has a family background in real estate and has been brave enough to pool all these things into one. You can even buy a lamp from Sans Pere, if you have a spare £750. We received a warm welcome and were shown to a table near the newly expanded windows. An excellent job has been done on the refurb with an abundance of natural light pouring through and reflecting off straight edged shiny surfaces and a gorgeous floor-to-ceiling glass-walled kitchen. The loos have been completely redone, which will be a relief to anyone that knew the venue in its previous life! The food too is fashionable but not at the expense of fantastic flavours. 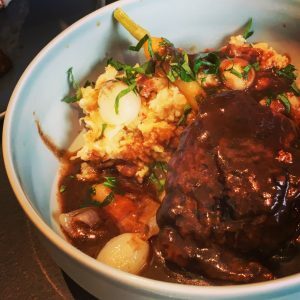 I was recommended the Coq au Vin with Butter Bean Mash, which was superbly cooked and put together, and perfect for the overcast day. 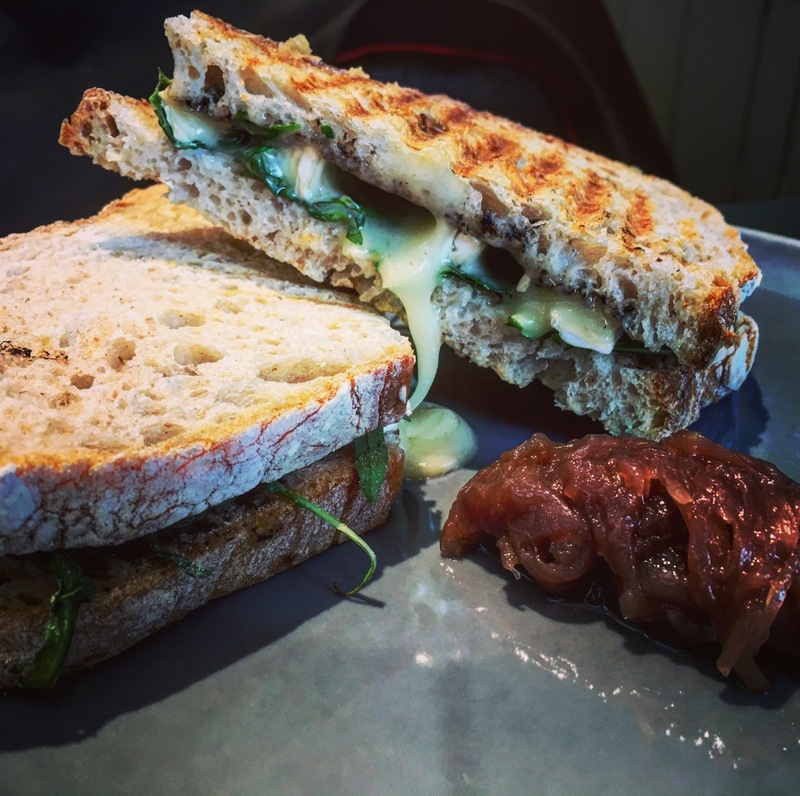 Manuel opted for a Brie and Truffle toasted sandwich plus a Salmon and Spinach Quiche both of which were soft and crispy in all the right places. We didn’t have time for a coffee (and by this point in the day I was about to pop!) but we took some “bronuts” to share with the lovely team at iHorizon who we were going to meet to talk accounting. Sans Per is not a new version of what has gone before; this is something completely new. If I was still living around the corner, I don’t think I would be spotted there on a Sunday morning, book in one hand and some variety of egg poised, dripping on expectant fork in the other. I think like a lot of “new” Old Street, Sans Pere is just a bit too cool for a just-out-of-bed, probably a little hungover, local. However the area attracts people from all over London ,and the world, who will absolutely love Sans Pere, and I’d certainly suggest it to friends when getting together for a bit of a special “oooh let’s treat ourselves” style occasion. 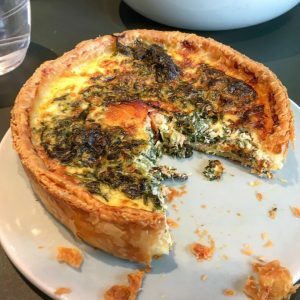 Both Old Street Records’ Cafe and Sans Pere are evidence of the consistently changing face of the area and the abundance of choice enjoyed by Londoners. 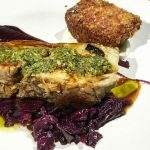 It is sad to see old favourites disappear – a statement as true when applied to venues as it is to the people with whom I spent my time – but fast paced evolution is what makes Old Street exciting. Somehow, remembering what went before and being able to reflect on the change, strengthens the relationship with a place I used to fondly call home.